DALLAS — June 2, 2016 — Southwest Airlines Co. (NYSE: LUV) is partnering once again with Discovery Channel’s Shark Week, taking television’s longest-running and most anticipated summer event to new heights. 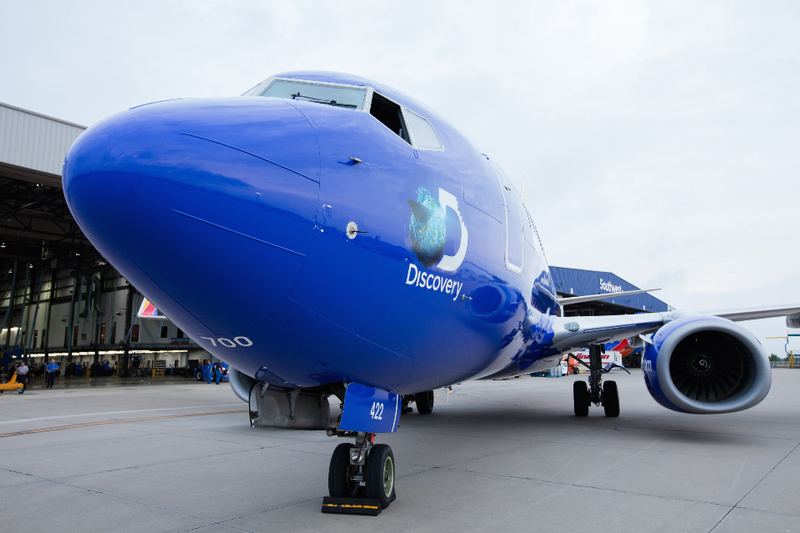 Today, the companies unveiled the first-ever Shark Week-themed 737-700 aircraft proudly displaying the majestic sea life that is widely celebrated by millions during Discovery’s Shark Week, airing June 26 through July 3. The aircraft will fly as part of the carrier’s fleet through Aug. 31, 2016. 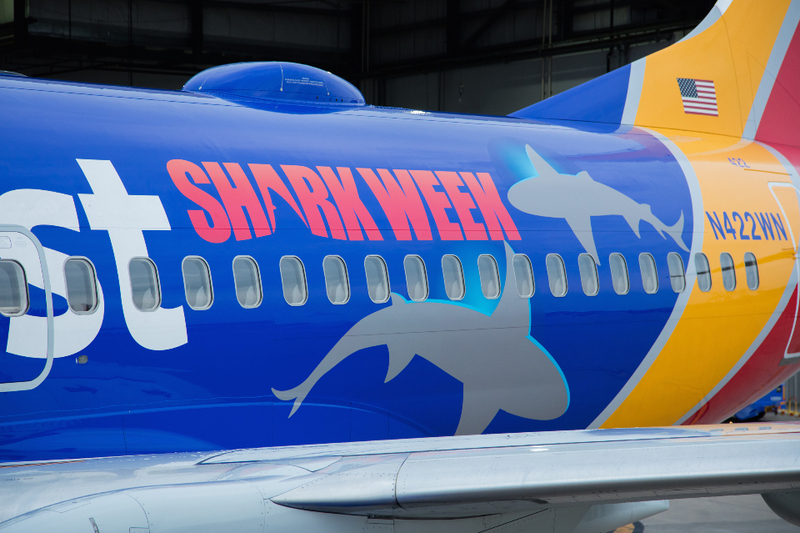 Customers who catch a glimpse of the Shark Week-themed plane during their summer travels are encouraged to snap a photo and share it with @SouthwestAir and @SharkWeek, using the hashtag #SharksTakeFlight for a chance to receive fin-tastic custom Shark Week swag. 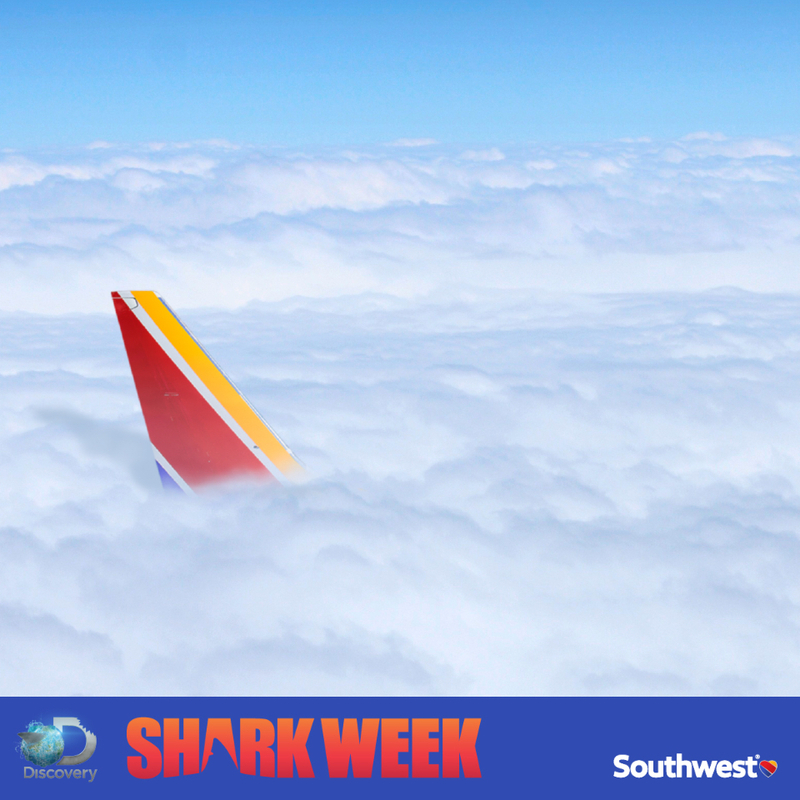 As Shark Week fans around the globe anticipate the best week ever, Southwest Customers can get in on the action early. Only on Southwest Airlines can Customers enjoy exclusive, jaw-dropping, never-before-seen content brought to you by Discovery. 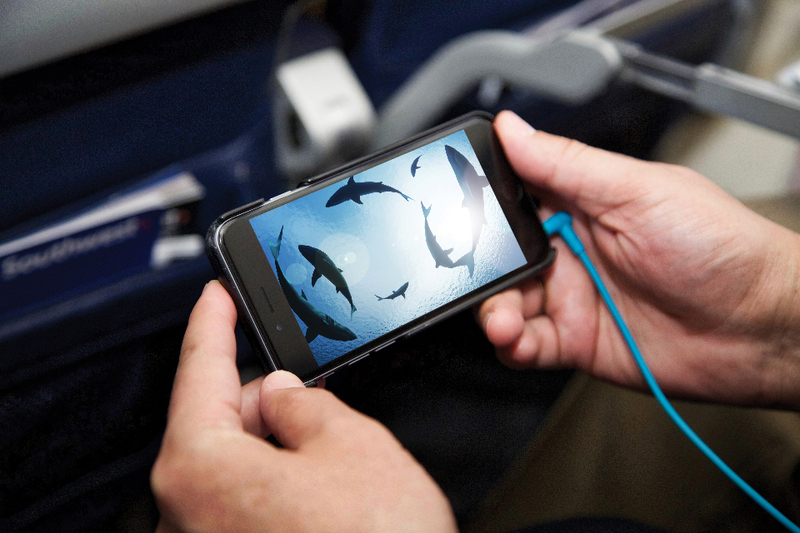 Onboard Wifi-equipped flights beginning June 1, Customers can sit back in “Shark n’ Awe” to enjoy Jungle Shark nearly one month before airing during Shark Week. The exclusive episode of Jungle Shark will take Customers on a deep dive into the rainforests of Costa Rica with Marine Biologist Dr. Craig O’Connell and Andy Casagrande to find out why young bull sharks swim up the river, and how they avoid the 12-14’ American Crocodiles living there. "Now more than ever brands have to be creative and unique in their approach to reach new Customers," said Linda Rutherford, Chief Communication Officer for Southwest Airlines. 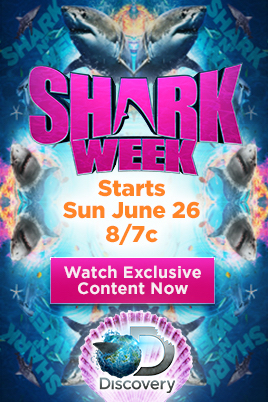 "Partnering with Discovery’s Shark Week allows us to connect with our Customers in a fun and memorable way. 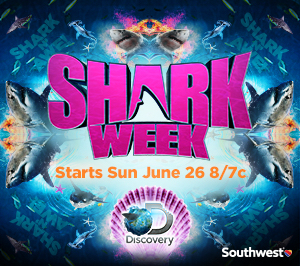 Only on Southwest can you enjoy this Shark Week experience, and that’s what it’s all about." •	Southwest Airlines and Discovery Channel are taking Shark Week to new heights! •	As the largest domestic carrier, serving more than 100 million passengers yearly, Southwest® is in the business of connecting Customers to what is important in their lives – in this case, we’re connecting to the millions of fans around the world who tune-in each year for the week-long pop culture phenomena, Shark Week. •	Southwest operates a fleet of more than 700 aircraft, with 81% of the fleet WiFi-equipped, offering complimentary live TV via the Southwest Entertainment Portal. 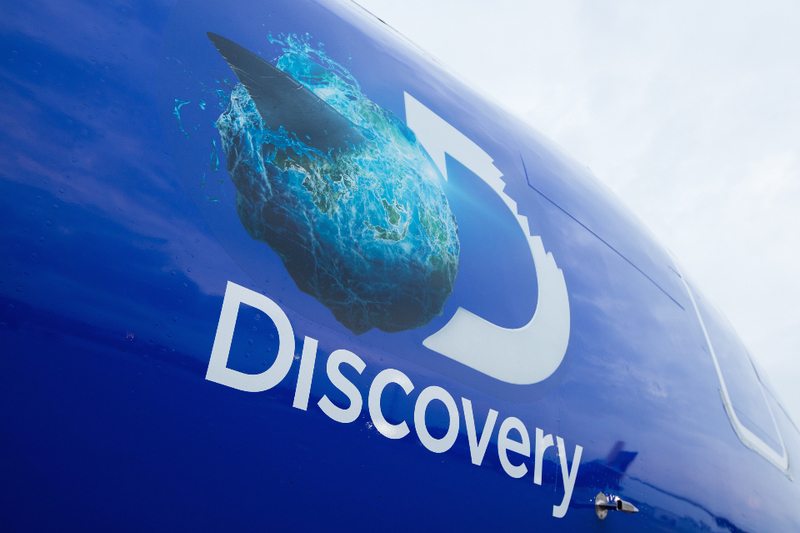 Only on Southwest Airlines is Discovery giving Customers the opportunity to enjoy never-before-seen Shark Week content, Jungle Shark, before it airs June 26-July 3. •	Southwest and Discovery are sending a family of four on a jawsome Mexico vacation, including roundtrip airfare for four to Puerto Vallarta, Mexico; $2,000.00 hotel gift card, equal to a four-night stay; $1,000.00 Visa gift card to use towards an aquatic adventure and travel expenses. Enter for a chance to win at southwest.com/sharkweek. Want to head to Costa Rica to experience Jungle Shark for yourself? Southwest can get you there. Catch a nonstop flight to San Jose (SJO) or Liberia/Guanacaste (LIR), Costa Rica from Los Angeles (LAX), Houston-Hobby (HOU) and Baltimore/Washington (BWI). If shallow waters are more your thing, Southwest and Discovery are sending a family of four on a jawsome Mexico adventure. 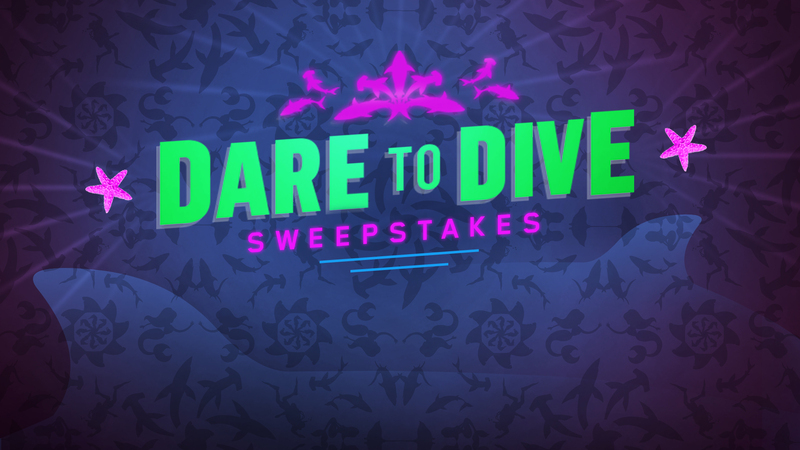 Enter the Dare to Dive Sweepstakes for a chance to win a trip to Puerto Vallarta, Mexico (PVR), including roundtrip air travel for four on Southwest, a $2,000 hotel gift card, and a $1,000 Visa gift card to put toward an aquatic excursion for the entire family. For full rules and to enter for a chance to win, visit Southwest.com/sharkweek. Customers traveling today onboard the Shark Week-themed aircraft on Flight 10 from Dallas Love Field to Orange County/Santa Ana (SNA) will be surprised with jaw-dropping Shark Week goodies including Shark Week-themed neck pillows, Shark Week fin hats, “I Flew with Shark Week” buttons, Shark Week koozies, sunglasses, and even washable tattoos! In its 45th year of service, Dallas-based Southwest Airlines (NYSE: LUV) continues to differentiate itself from other air carriers with exemplary Customer Service delivered by more than 50,000 Employees to more than 100 million Customers annually. Southwest operates more than 3,900 departures a day during peak travel season across a network of 97 destinations in the United States and seven additional countries. Service to Long Beach, California, the carrier’s 98th city, begins June 5, 2016. Based on the U.S. Department of Transportation’s most recent data, Southwest Airlines is the nation's largest carrier in terms of originating domestic passengers boarded. The Company operates the largest fleet of Boeing aircraft in the world, the majority of which are equipped with satellite-based WiFi providing gate-to-gate connectivity. That connectivity enables Customers to use their personal devices to view video on-demand movies and television shows, as well as more than 20 channels of free, live TV compliments of our valued Partners. Southwest created Transfarency℠, a philosophy which treats Customers honestly and fairly, and in which low fares actually stay low. Southwest is the only major U.S. airline to offer bags fly free® to everyone (first and second checked pieces of luggage, size and weight limits apply, some airlines may allow free checked bags on select routes or for qualified circumstances), and there are no change fees, though fare differences might apply. In 2014, the airline proudly unveiled a bold new look: Heart. 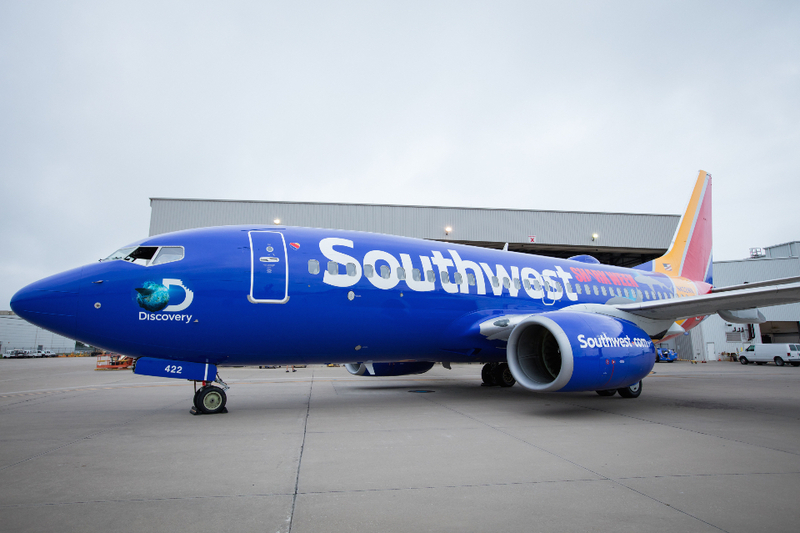 The new aircraft livery, airport experience, and logo, showcase the dedication of Southwest Employees to connect Customers with what’s important in their lives. From its first flights on June 18, 1971, Southwest Airlines launched an era of unprecedented affordability in air travel described by the U.S. Department of Transportation as "The Southwest Effect," a lowering of fares and increase in passenger traffic whenever the carrier enters new markets. With 43 consecutive years of profitability, Southwest is one of the most honored airlines in the world, known for a triple bottom line approach that contributes to the carrier's performance and productivity, the importance of its People and the communities they serve, and an overall commitment to efficiency and the planet. 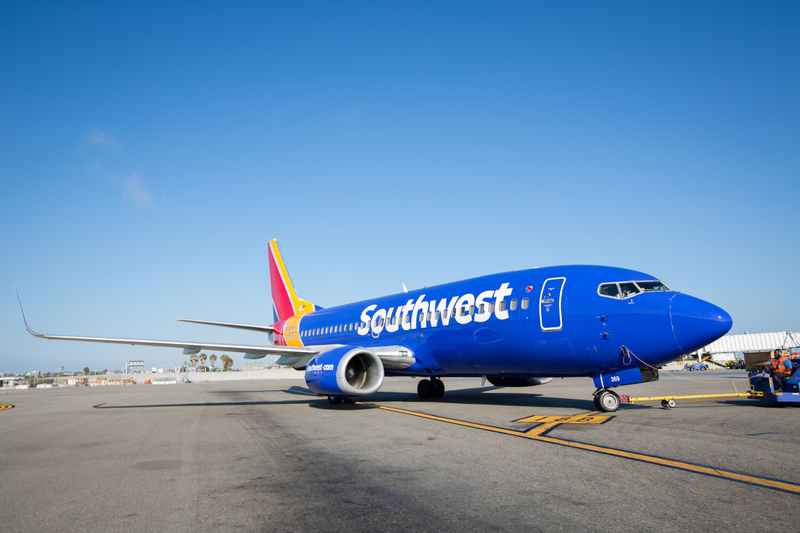 The 2015 Southwest Airlines One Report™ can be found at SouthwestOneReport.com.